April is poetry month, and over the last few weeks, several poetry-themed programs took place in the library. This past Saturday, the New Canadians’ Centre of Excellence, in conjunction with the Central Branch hosted our third MANY VOICES, MANY LANDS event. 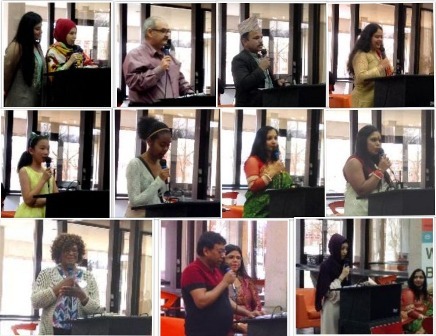 Recitations were spoken in Arabic, Bengali, Chinese, Hindi, Nepali, Persian, and Urdu as well as English, as participants shared poems by favourite traditional authors, or verses of their own creation.